Every family needs a picture book version of the Little Red Riding Hood tale. 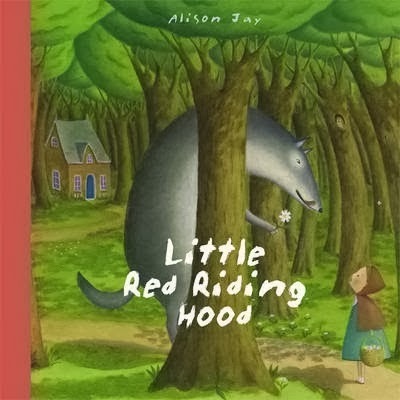 This version, Little Red Riding Hood, re-written by Katie Cotton and illustrated by Alison Jay, has lovely simple language and illustrations. It was published in Australia by Koala Books (2013) and the RRP is $14.99. In the UK, the publisher is Templar. Even though the Wolf is suitably menacing, this isn't a violent story. The woodcutter uses rope and the wolf is not cut open, but carted off in a barred wagon to a special school for naughty fairy tale creatures. There's a sub story told via the charming illustrations, and kids will delight in recognising folk from other fairy tales. To extend the literature experience of Little Red Riding Hood, children could create puppets to re-tell the story. They can make their own dioramas from cardboard boxes, and add card figures too. Creaza has a Red Riding Hood world where children can create a comic version online. 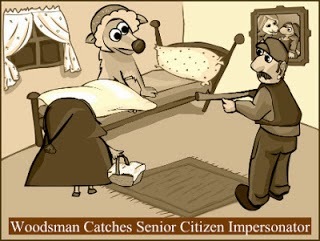 This is a fun place to invent headlines for the Fairy Tale Times, the way I did below. Read KBR's review of Little Red Riding Hood. Find more Children's Book Reviews on The Book Chook by clicking Reviews in the right sidebar.